The greater sand plover (Charadrius leschenaultii) belongs to the family of lapwings and plovers, the Charadriidae. The greater sand plover species is distributed in Europe, west, east and central Asia, Africa, Indian subcontinent, southeast Asia and Australia. These plover species are fully migratory. These plovers are polytypic species. The greater sand plover (Charadrius leschenaultii) is a medium-sized plover, measuring 20 to 25 cm in length and weighing 55 to 120 grams. The wingspan is 45 to 60 cm. The male breeding greater sand plover has grayish brown back and white underparts. The crown, nape, hindneck and sides of neck are chestnut. The tail has dark brown subterminal band. The forehead is white. There is a dark eye band. There is a broad chestnut band across the upper breast. The bill is stout, pointed and black. The irises are dark brown. The legs and feet are long and greenish gray in color. The call of these greater sand plover species is a soft trill or a short rolling "trrri" or "trrrr" sound. These greater sand plover species are distributed in Europe, west, east and central Asia, Africa, Indian subcontinent, southeast Asia and Australia. The greater sand plover nominate subspecies C. l. leschenaultii is distributed in western China, Mongolia and Russia (southern Siberia). It winters in coastal southern Asia, southeast Asia and Australia. 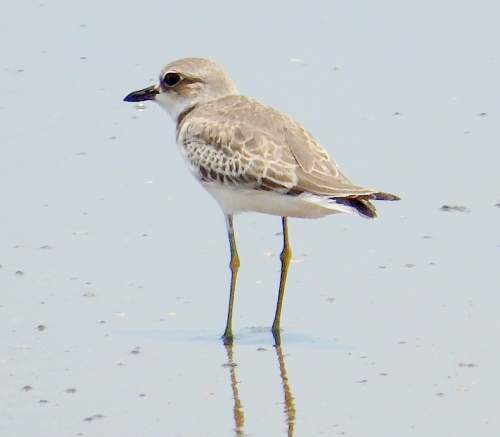 The plover subspecies C. l. scythicus is distributed Afghanistan, Turkmenistan, Uzbekistan, Tajikistan, Kyrgyzstan and Kazakhstan. It winters in coastal northeast and eastern Africa and coastal Indian subcontinent. The greater sand plover subspecies C. l. columbinus breeds in Turkey, Syria, Jordan, Armenia and Azerbaijan. It winters Red Sea, Gulf of Aden and southeast Mediterranean region. The Important Bird and Biodiversity Areas (IBA) of the greater sand plover species in Australia are Eighty Mile Beach and Roebuck Bay. The IBA in Kazakhstan are Altyn-Emel National Park, Arys-Karaktau State Reserved Zone and Zhusandala. 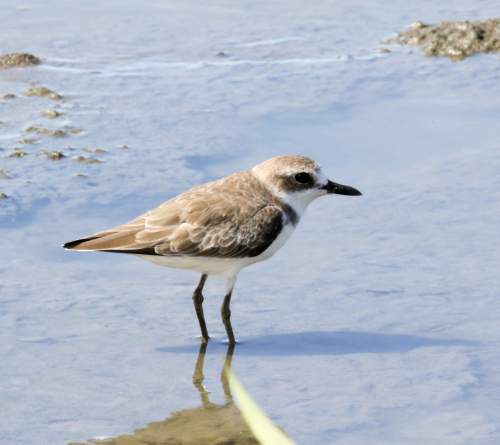 The IBA of the greater sand plovers in Malaysia are Sadong-Saribas coast, Pulau Bruit National Park, North-central Selangor coast, Malaysian Brunei Bay and Bako-Buntal Bay. The IBA in Brunei is Brunei Bay. The IBA of the greater sand plover species in Saudi Arabia are Tarut Bay and Sabkhat al-Fasl lagoons. The IBA in Oman are Barr al Hikman and Masirah island. The IBA in Jordan are Azraq and Burqu'. These greater sand plover species do not normally occur in forests. They normally occur in altitudes from 0 to 3000 meters. The natural ecosystems and habitats of these plover species include hot deserts, temperate grasslands, wetlands, tide pools, lagoons, brackish water lakes, marshes, coastal sand dunes, mudflats, shorelines, sea cliffs and rocky offshore islands. The diet of these greater sand plover species consists mainly of invertebrates. Beetles, termites, midges, ants and insect larvae are the primary food of the inland breeding populations. They occasionally prey on lizards (del Hoyo et al. 1996). 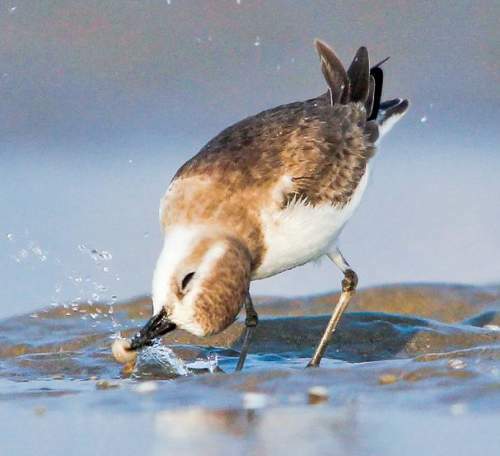 The wintering plover populations feed on coastal invertebrates like molluscs (bivalves and snails), crustaceans (shrimps and crabs) and worms (polychaetes and earthworms). They forages visually, with a running, pausing and pecking action. The breeding season of these greater sand plover species is during April and May in central Asia. The laying season is from March to May in Turkey. These species are monogamous and territorial. The nesting sites include open deserts, semi-arid areas and expanses of bare gravel or sandy grounds. The nest is a shallow scrape on the ground. It may be lined with plant material. The greater sand plover clutch contains two to four, pale buff colored eggs with dark blotches. Both the parents incubate the eggs. The chicks hatch out after 24 days and become independent after about 30 days. These greater sand plover species are fully migratory birds. The breeding populations occur in west, central and eastern Asia. They migrate southwards without stopping, on a broad front, between June and August. The greater sand plover arrive in the wintering grounds between July and November. The return northwards migration to the breeding grounds occurs from late-February to early-May (del Hoyo et al. 1996). The sub-adults remain back in the wintering grounds. The global population size of the greater sand plover (Charadrius leschenaultii) is estimated to number about 154,000 to 340,000 individual birds. The overall population trend of the species is considered to be decreasing. 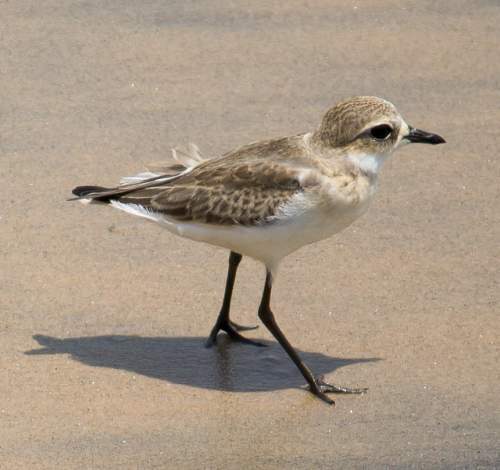 In most of its range, this plover species is reported to be generally uncommon to rare. The generation length is 5.8 years. Its distribution size is about 9,850,000 sq.km. Habitat alteration, fragmentation and destruction, human intrusions and disturbance, coastal aquaculture activities and commercial hunting are the main threats that are endangering the survival of these plover species. The greater sand plover (Charadrius leschenaultii) does not approach the thresholds for being Vulnerable, either under the range size criterion, or under the population trend criterion or under the population size criterion. The CITES (Convention on International Trade in Endangered Species of Wild Fauna and Flora) status is ‘Not Evaluated’ for the greater sand plover (Charadrius leschenaultii). C. l. scythicus Carlos, Roselaar & Voisin, 2012. Current topic in Birds of India: Greater sand plover - Charadrius leschenaultii.